Colin fitted my cat flap today and I'm thrilled with the result. 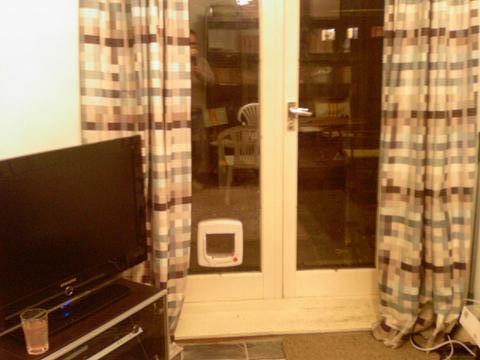 It was quite an unorthodox request (a cat flap going through a wide pillar), but Colin was happy to talk it through and ensure we came to an unobtrusive solution that works in the aesthetics of the room. I'm sure the cats will be equally as happy with it! We tried many glaziers and 'so called' cat flap fitters before we happened across www.catflapfitter.co.uk....thank God! We weren't getting anywhere with the others. Nobody wanted to take the job on. What we needed was a cat flap fitted to the bottom pane of our garden door. The problem was that it was made of old Georgian wired glass. as cutting holes in this type of wired glass was impossible without considerable collateral damage to the glass. Not so with "Cat Flap Fitter"! He was willing to take the job on. Not only did he arrive bang on time, but did the job like a true craftsman for next to nothing...£40 quid to be precise! We can't say enough good things about the whole experience. We would recommend “Cat Flap Fitter” anytime. 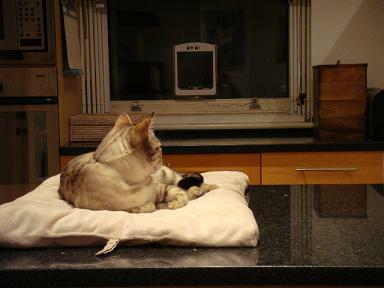 Our cats, Trumpet and Audrey were also very pleased with the flap. Colin came out two days after I called and fitted the cat flap for me. After he’d gone I noticed a problem with the cat flap and called Colin. He came back after the weekend and exchanged the cat flap and refitted it perfectly at no extra cost. but it’s brilliant, and Seb the cat loves it. I’d recommend Colin’s service to anyone. Thank you so much for fitting the cat flap - here is the letter of recommendation. much more of a pleasant service than with working with a big chain, it was a friendly service, on first name basis. The cat flap was fitted and it look amazing, brilliant job highly recommend this service. Hi Colin, thanks for coming round on Thursday to fit the dog flap, Mack and Molly have started to use it all the time and enjoy their independence! After contacting a number of glaziers with little success, I bought a dog/cat flap for my double glazed patio door direct from the supplier, Staywell. I asked for a recommendation for a fitter and they gave me Colin’s telephone number who responded to my request for a quote quickly. 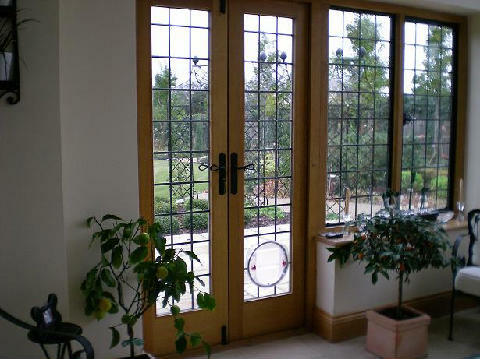 He arrived at the appointed time and supplied a quote that was reasonable and more competitively priced than the over inflated prices some glaziers had quoted. We arranged a time to fit the flap and on having an unexpected day off earlier, he offered to come in sooner and fit the flap which he did quickly, with minimum fuss and also took the time to ‘introduce’ my dogs to the dog flap. I was very impressed with Colin’s professionalism, level of service, cost of service, timing and neat job done. I would highly recommend him as a first call for anyone who needs to have a cat or dog flap fitted. Thanks so much for the great job you did on Wednesday. 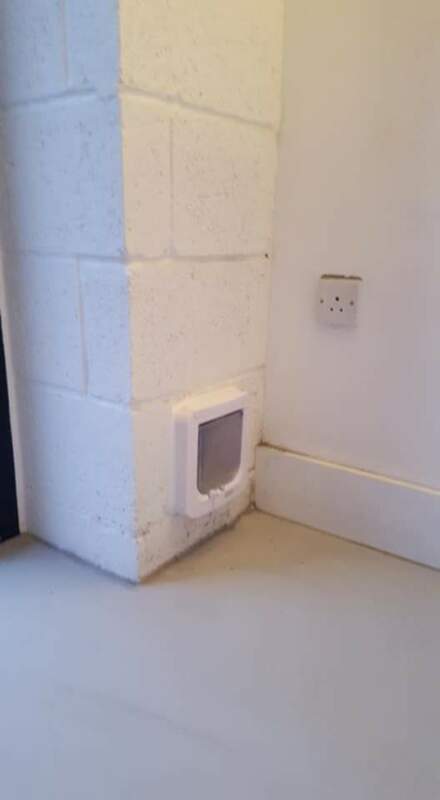 I was really worried when I moved into a house with a UPVC door that I would never be able to fit a cat flap into it, and was so delighted to find your brilliant site. I wasn’t disappointed. The service was prompt, efficient and professional, and we now have a beautiful new cat flap, and a back door which closes better than it did before! I would recommend your service to anyone without reservation. Excellent service - I found the website through Google and am very glad I did! Colin came and measured up really quickly and then fitted the cat flap into our glass panel door soon after. He also fixed the door lock and the patio doors which were jamming with no hassle! Would definitely recommend. We moved home last month and decided to have 2 cat flaps fitted professionally. Colin arrived when he said he would with everything he needed. He had recommended PET PORTE chip reader cat flap for the external door. Colin fitted both cat flaps beautifully - really professional job - and he didn't go in and out to his van a 1000 times, a nightmare for pet owners who have just moved home!! It has worked like a dream. Claret and Blue decided to make their own break for freedom within a few days of moving in so we set it up and its been great. The instruction manual is also very easy to use and understand. Claret used to battle with the other flap trying to pull the door towards her but the lighter clearer door makes her use it as designed. Blue was losing 2 collars and magnets a month, as well as bringing in various nails and other trinkets with the magnet - now they've gone back to mice -eek - unfortunately the chip reader is not sophisticated enough to lock when you cat is carrying prezzies - I'm sure its just a matter of time! 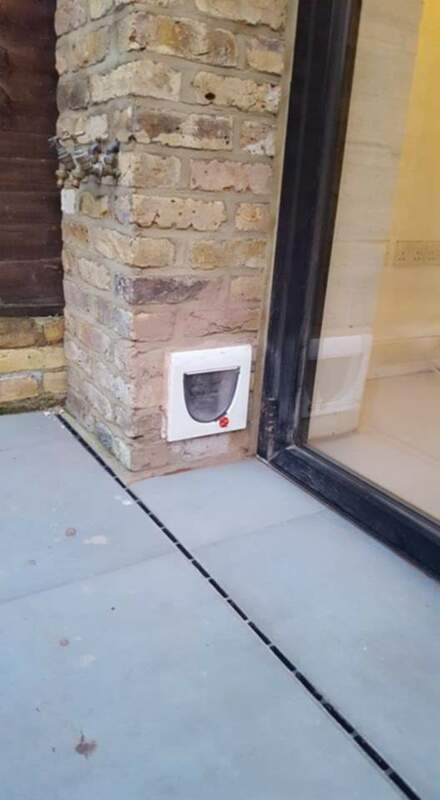 Its also a lovely looking cat flap (pictures to follow) if there is such a thing and we haven't been spending a fortune on feeding visiting cats. Thanks again Colin, we would recommend your service to anyone. Here is a testimonial as promised, although sorry a little late. Hope all going well with the business. We urgently had to install a new front door which came without a catflap & would have looked ridiculous with one. The old door had had a catflap in for approximately 8 years or so. Our cat 'Tom' now being cat flapless & a creature of habit showed us his displeasure at having his front door taken away by ensuring we had to get up at least once or twice during the night to let him out & generally giving us grief , which we could fully understand. We had to quickly think of an alternative, which we did. We saw Colin's website & gave him a call. Explained that we urgently required a cat flap to be fitted in our double glazed patio doors, (we were not sure even if this could be done). Colin said this would not be a problem & gave us a quote which we were happy with. Although busy he fitted us into his schedule & came on the Saturday evening, travelling some distance to get here & measured up for a new double glazed unit. He was very friendly & professional & certainly knew his stuff. Although close to Easter he rang on the following Wednesday to advise that the unit had been received from the glaziers & he could install it for us the following day(the day before Good Friday) & true to his word he came along with someone he was training up & within half an hour it was all done. An excellent job. 'Tom' is very happy with his new 'Luxury' Cat Flap & has quickly got used to it & we are extremely happy, as no more interrupted nights. Thank you. Just a note to say many thanks for your efficient measuring and fitting of the cat flap. Having recent moved into a new house, I needed a cat flap installing for my 2 cats. Without hesitation, I contacted Colin who arranged to come out and measure up to fit one in my patio door. A week later I have a cat flap fitted and 2 happy cats! I cannot thank you enough for your help and a job well done. No mess, no fuss. Nothing is too much trouble for 'The Cat Flap Fitter'. I will highly recommend your services to anyone who asks. Good Luck for the future and I hope that the business goes from strength to strength. I meant to send this a couple of weeks back but work n stuff got in the way, you know what it's like. 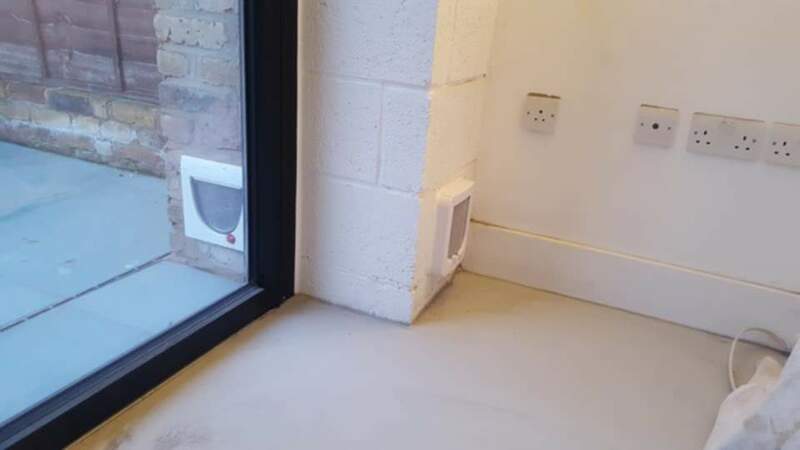 'Colin did a brilliant job for us, installing our 'Sureflap Microchip catflap' and charged a very reasonable price too. He also sorted out a dodgy door fitting for us and gave us good advice on other building matters that we knew nothing about. We recommend Colin for all your catflap fitting needs, a very knowledgeable man and a lovely geezer too. I was so lucky to stumble across this company and Colin on an online cat discussion forum, they were prompt, excellent value and really friendly. From initial contact through to measurement, delivery of the new door pane with pre-cut hole and fitting was less than 2 weeks! 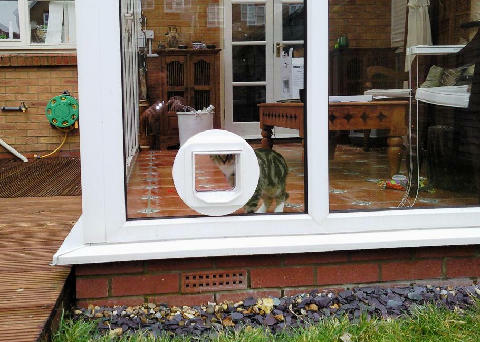 Before I found Colin I was worried that I wouldn't be able to have a cat flap as I have a PVC double glazed back door but Colin and his company are really experienced and gave an excellent professional service at all stages. Colin was more than willing to answer all my questions and clearly loves his job and all creatures great and small. I would recommend Colin and this company to anyone. ten out of ten. Colin, a comment for your website. "Colin was a true professional, a rare breed who clearly takes pride in his work. He was asked to fit two cat flaps for us and his advice, workmanship, competitive pricing and general helpfulness was top class. I would recommend his work without any doubt. Genuinely I could not fault the job from quote to finish." Many thanks Colin. Great job and a top bloke. Rare indeed.